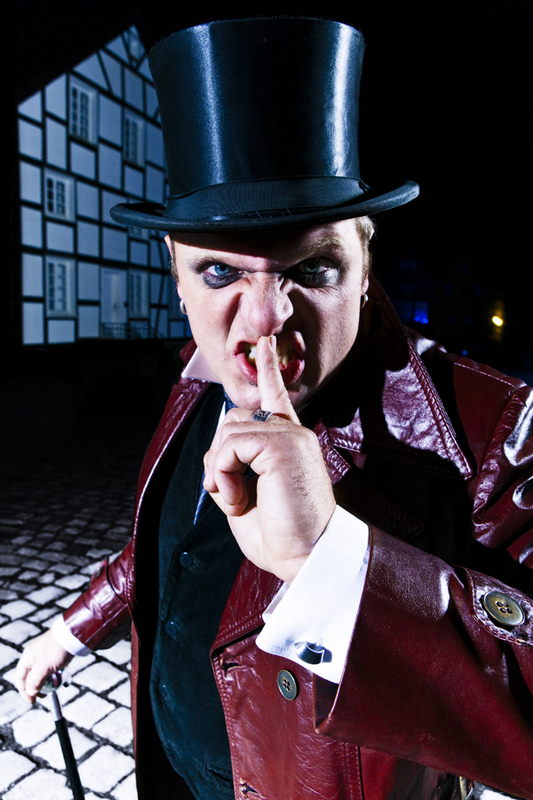 German Metal Hammer presents the exclusive video premiere to the single “Boys ’n’ Men“!!! The fighter hymn “Boys ‘n‘ Men“ is released this friday (15th June, 2012) as first single from the in August upcoming KAMIKAZE KINGS album “The Law“. “Boys ‘n‘ Men“ is available now at all download stores like iTunes, Musicload, Amazon MP3 etc. as single and will include the doomy semi-ballad “The Dream Is Dead“ as a bonus track plus the music video “Boys ‘n‘ Men“ in the vingle version. World exclusively German Metal Hammer presents the music video of “Boys ‘n‘ Men“ which you can watch at www.metal-hammer.de. 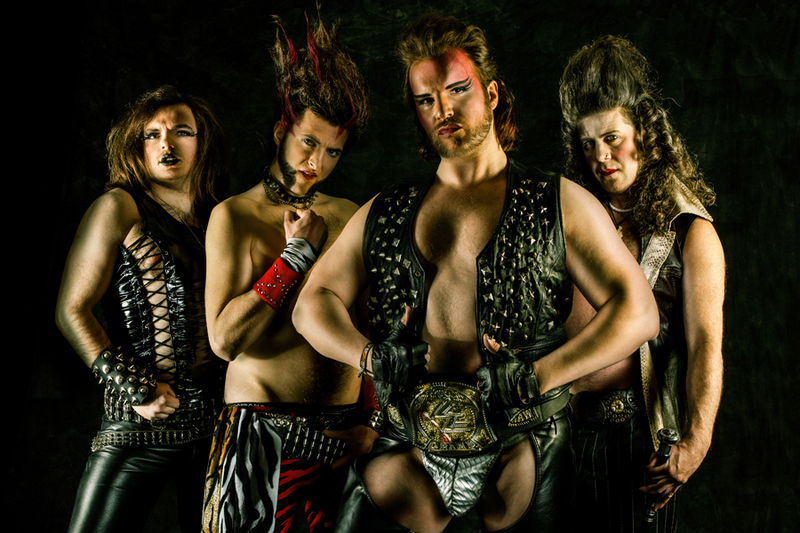 Be prepared for leather, sweat and rivets with a rich portion of Glamour-Wrestling mania. “Boys ‘n‘ Men“ is not only rocking, but it is also a great entertainment for people, who are not of a tender or weak nature! These four Berlin guys don’t only know how to act controversially and nonconformally on stage, but also at the big screen. The new video clip of “Boys ‘n‘ Men“, directed by Kornelius Glaser (www.videokorn.de) polarizes and captures you in all its intensity and visual impact which makes KAMIKAZE KINGS appear in an extraordinary apocalyptic, surreal light which reminds you of the comic world of Frank Miller. 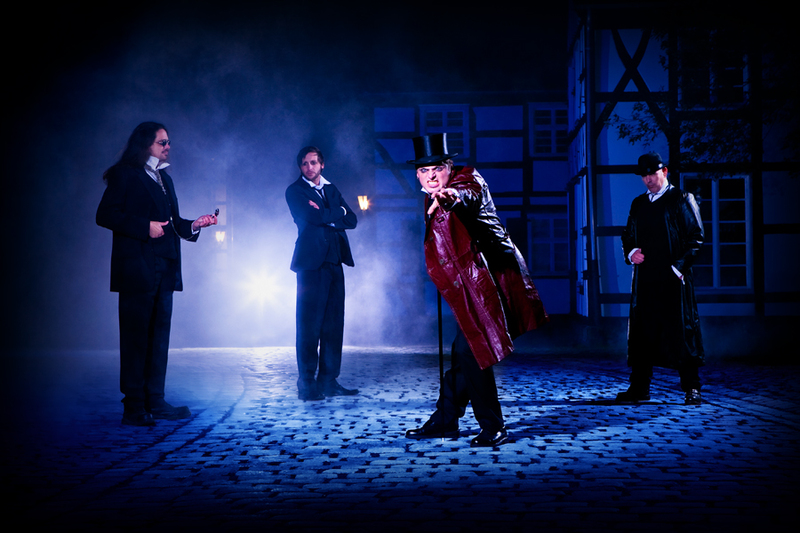 With a finishing move of a very special kind ends the short trip to the wet and cold, dark backyards of Berlin. Best Rock ‘n‘ Roll Extravaganza band photos ever!!! 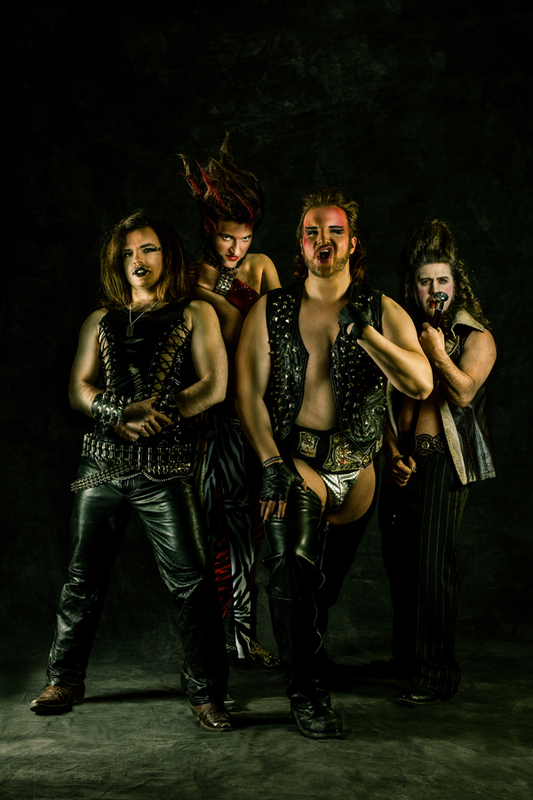 In the course of their new music video, KAMIKAZE KINGS shot new band photos that perfectly show the trademarks of the Berlin band around vocalist Elmo Kamikaze, a cross-breed of “The Rock“ and “Rob Halford“. The songs, the performance and devotion with which the musicians go about at their stage performances, transports a sense of life, an attitude and a love towards the most beautiful matter of the world: Rock ‘n‘ Roll. All of this was captured by photographer Martin Hoppe (www.phat-photo.de). You can gaze at those small masterpieces at www.kamikazekings.de. KAMIKAZE KINGS are already excited about your reactions to the photos and the new video “Boys ‘n‘ Men“ on their Facebook page and are curious for your feedback. Frontman Elmo left a video message for you about the newest events on YouTube and Facebook. Check it out, it is worth it! 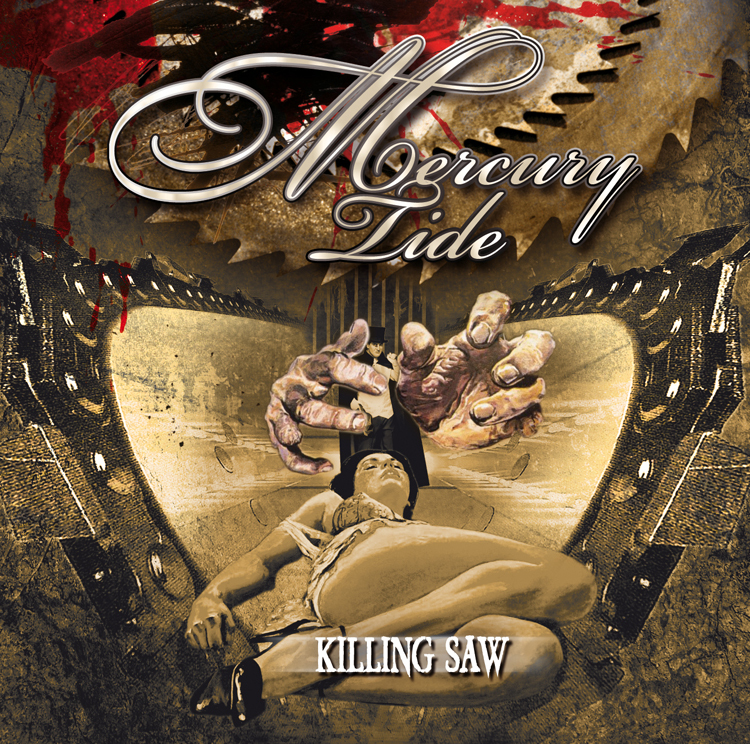 MERCURY TIDE: On the road with the new album “Killing Saw“!!! Like a phoenix, rising from the ashes, Dirk Thurisch, one of the most important German melodic metal vocalists, has returned with his band MERCURY TIDE and the new album “Killing Saw“! Introduced through both release shows that took place a week before the official sales start, “Killing Saw“ is now available everywhere in Europe since the 25th of May (i.a. EMP, MAM Online, Amazon, iTunes, Tower Records, WOW HD, CDON or CD Inzane). The USA still has to wait until 10th of July, until it is going to be released there, too. Rock Hard #301 (8/10): "Overall an absolutely successful album!" New shows with i.a. Jon Oliva’s Pain announced!!! After MERCURY TIDE celebrated with you at their two release shows, like you can listen and see at the band’s Facebook page, it is now time for new concerts! 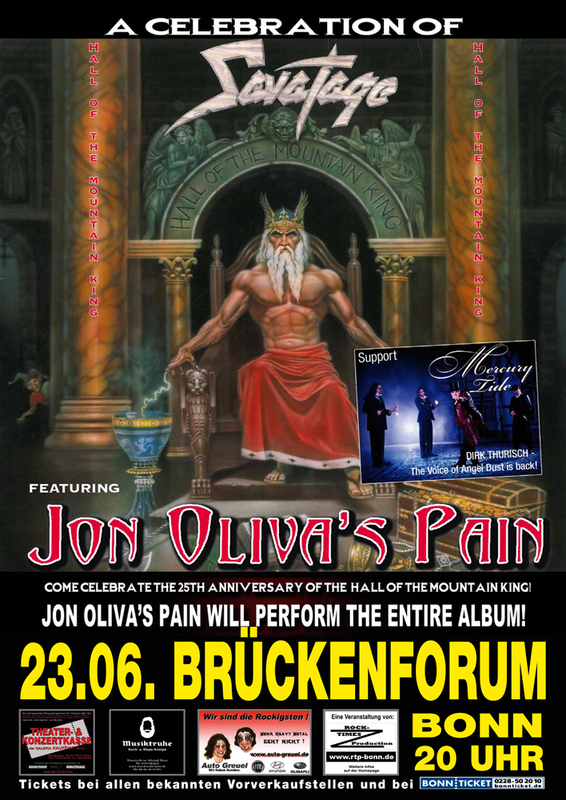 We are happy to share with you that MERCURY TIDE will support Jon Oliva's Pain at their “A celebration of Savatage - the 25th anniversary of «The Hall Of The Mountain King»“ show on June 23rd at Brückenforum in Bonn (Germany). They will continue at the Turock Open Air, where MERCURY TIDE will play with i.a. Rage, Helstar, Lillian Axe and Iron Savior on August 31st, 2012. More tour dates will be announced in a short time! MERCURY TIDE recorded some liner notes videos for you. Here you can catch some first impressions, whereas Dirk will not only introduce the songs of the album “Killing Saw“, but also share some nice and funny anecdotes. Watch part 1-6 on MERCURY TIDE YouTube channel!